Savory beef shanks served over cauliflower puree. 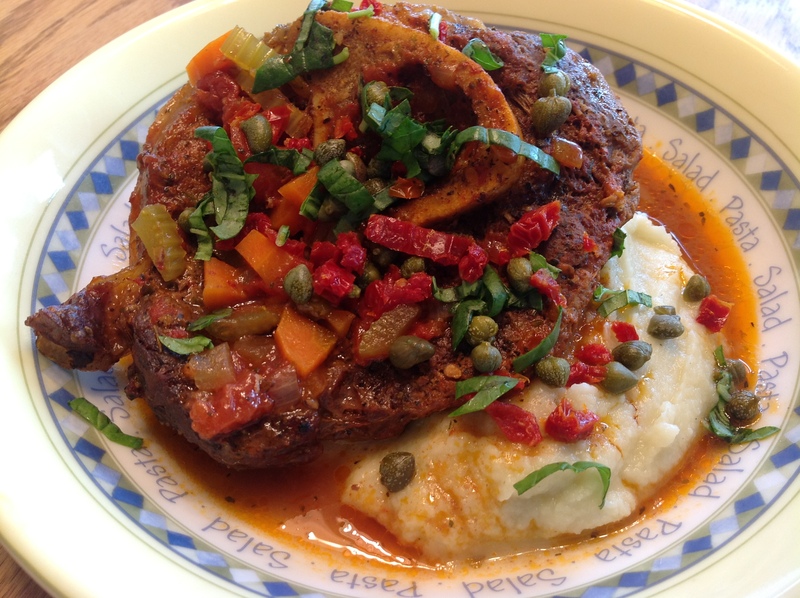 I think Osso Bucco is a perfect Paleo food. Meaty goodness surrounding marrow bones slowly braised in bone broth. What else could you want? I love the beef shanks we get from our farm share. They are very meaty and have lots of delicious marrow. At about one inch thick, one is the perfect helping for me and two seems to hold Alex for a few hours. I played around with different recipes, but they all seem to center around the same basic ingredients: shanks, bone broth, and tomatoes. I added a secret ingredient – anchovies! Full of unami flavor and not fishy at all! Here’s what I did – enjoy! Preheat your oven to 350 degrees. In a large Dutch oven (7 quarts minimum), melt 1-2 Tablespoons of your fat of choice over medium heat. Make sure it evenly coats the bottom of the Dutch oven. Sprinkle the shanks on both sides with sea salt and pepper. I find it is easiest to lay them out on a tray, season one side, place them seasoned side down in your cooking vessel and then season the other side. Place 3 shanks into the Dutch oven and brown for 4 minutes on each side. Remove to a tray and repeat the browning with the remaining shanks. While the shanks are browning, put the anchovies, garlic and tomato paste into a small bowl and smash it together with the back of a fork. Set aside. Once all of the shanks are browned and removed from the Dutch oven, add in the carrots, onions, and celery. Using a wooden spoon, saute the veggies for 5 minutes, scrapping up the browned bits on the bottom of the dish. Next add in the anchovy/tomato paste mixture, Italian herbs, and paprika. Continue stirring with the wooden spoon for another 1-2 minutes. Time to deglaze the pan – add in the lemon juice and stock. Vigorously scrap the bottom of the pan to remove any remaining browned bits (AKA flavor). Add in the tomatoes and gently smash them with the back of the wooden spoon. Throw in 2 bay leaves and add back the shanks and any juices they have given off. Try to nestle the shanks into the liquid, so they are somewhat submerged. Cover the Dutch oven and place it in the oven for 90-120 minutes. While the shanks are braising in the oven, make the cauliflower puree and the sun dried tomato topping. To make the topping, combine the sun dried tomatoes, capers, and basil in a small bowl. Set aside until ready to serve. For the cauliflower puree, steam the florets until they are tender. Pace the cauliflower and butter in a food processor and puree until smooth. Add sea salt and pepper to taste. Serve the shanks over the cauliflower puree and top with the sun dried tomato mixture. Anchovies, Basil, Beef, Capers, Carrots, Cauliflower, Celery, Garlic, Lemon, Onions, Stock, Tomatoes. Bookmark.